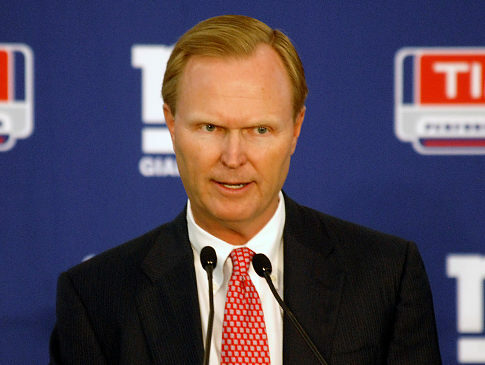 Giants owner John Mara has a lot on his plate these days: the lockout, the upcoming draft, and jury duty. Mara was named the fourth alternate juror for an international drug case in U.S. District Court and is expected to take three weeks to hear the case. The judge refused to let him off. This is ridiculous. The judge is obviously an Cowboys fan. There’s no other explanation. I could see if he was one of the actual jurors, maybe even the first alternate. BUT HE’S THE FOURTH ALTERNATE! He’s only going to have to do something if four jurors somehow get bounced. This isn’t the Springfield Nuclear Plant softball team. Is Juror #8 going to overdose on nerve tonic while Juror #11 gets thrown off the trial for failing to shave his sideburns? Mara is a lead negotiator in the lockout and runs a billion-dollar business. I’m all for fairness but if you run a billion-dollar business, you shouldn’t have to serve as an alternate in a three-week court case. There’s an easy solution. Replace Mara with the racist Asian lady that has to serve jury duty for life. Bing, bang, boom.